KFI Restaurant & Café Chairs Are Used For A Wide Variety Of Office, Reception Area, Conference Room, Cafeteria or Miscellaneous Assembly Seating Applications. KFI Restaurant & Café Chairs are made of solid steel framing and wood backs for long lasting durability and dependability. Straight legged design chairs feature contoured Natural, Espresso or Chocolate finished backs and comfortable Alpine Green, Black, Brown, Burgundy, Charcoal, Espresso, Natural or Navy color. 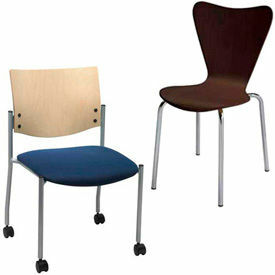 Vinyl or Fabric upholstered seats provide easy maintenance. Some models available with armrests or built-in casters on each leg for extra comfort and easy mobility. Weight capacity is 275 lbs. Dimensions vary per model. 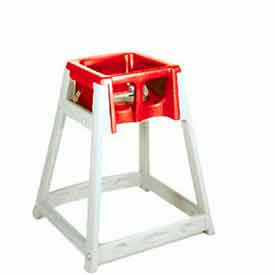 High Chairs and Booster Seats are Used For Seating Small Children Safely And Securely During Mealtime. Used for use in the home or when dining out, these Booster Seats and High Chairs provide a safe stable base for your child. Made of durable plastic or wood, the chairs are easy to clean and stackable when not in use. Carlisle Booster Seats Are Used For Restaurant Or Other Food Establishment Seating. 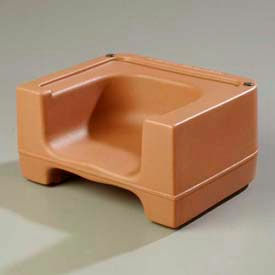 Booster Seats are one-piece molded polyethylene with wide square base for long lasting durability and stability. Two-sided seat offers a choice of heights. Extra-strong, Anti-skid pads on both sides prevent sliding. Booster seats with safety strap are available. Measures 15-1/2 in. L x 12-1/2 in. W x 8 in. H. Colors are Brown, Forest Green, Beige, Black and Red. Sold in package quantities of 4, priced each.